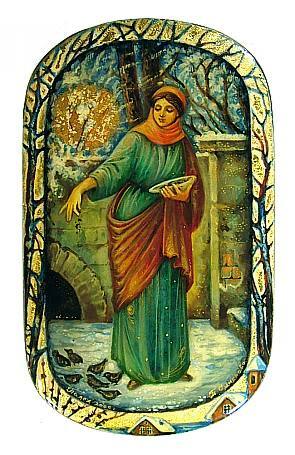 A young maiden lets a few crumbs sift through her fingers to a small group of birds at her feet. Behind her there is a stone fence and snow covered trees, an early morning sun shining brightly between their branches. The face of the young woman is very appealing, and is drawn with a softer, more naturalistic, approach than other boxes from this village. The skillful use of gold leaf makes the box even more special. Extremely thin gold lines give beautiful definition to the folds and shape of the maiden's clothing. A radiant golden sun in the background is strikingly beautiful, but somehow does not overpower the main subject of the scene. More modest points of gold are scattered elsewhere. A "frame" for the drawing consists of a golden strip that also shows snow covered tree branches and hints of a small town. The whole scene comes across as both classy and tender. 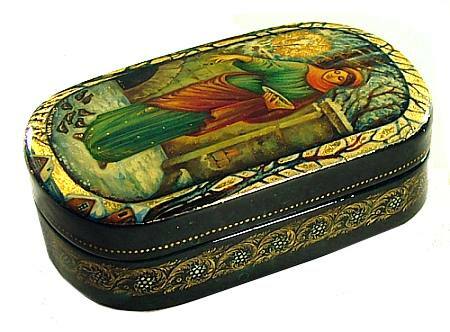 The box has a leafy gold flower ornament on the sides. The base color is a marble-like mixture of dark green and black. The box does not have a hinge and sits on four small round legs. It is signed with the name of the artist, village and year. On the bottom, the artist draws her own special T.S. (Tatyana Smirnova) symbol.